About the Wine: The Adobe Road 2016 Sparkling Rosé Wine is made from 40% Zinfandel, 30% Syrah, and 30% Grenache grapes sourced from Kemp Vineyard in Sonoma County’s Dry Creek AVA. The rosé was created using the saignée, or bleed-off, method. Each grape was bled and fermented separately in individual barrels. As Martin explains, this gave him the flexibility to use different yeasts, barrels, and fermentation temperatures dependent on each individual grape’s needs. The final blend was created before bottling. Flavor Profile: The Adobe Road 2016 Sparkling Rosé Wine is as dark a pink as you think judging by the bottle. In fact, it’s borderline red, with just a tint of orange along the perimeter. The rosé smells, very simply, like strawberries and champagne. The palate is where it’s at with this sparkler. It’s quite dry, crisp, and completely reminiscent of a light to medium bodied red wine. Dominant flavors are of strawberry jam, hibiscus tea, watermelon, chipotle peppers (not spicy, just the flavors of), and fresh basil. There’s a lingering heat of a tingle on the tongue on the finish, a warmth in the heart, and just the slightest bit of sweetness that kisses the lips. Food Pairing: Because the Adobe Road 2016 Sparkling Rosé Wine has a good body to it, you could easily pair this with food. I’d recommend a light, refreshing starter like fresh crab cakes, a beetroot and goats cheese salad, or a stone fruit gazpacho. I, personally, enjoyed the Adobe Road 2016 Sparkling Rosé Wine on its own as an aperitif. It paired perfectly with a lazy Friday evening. 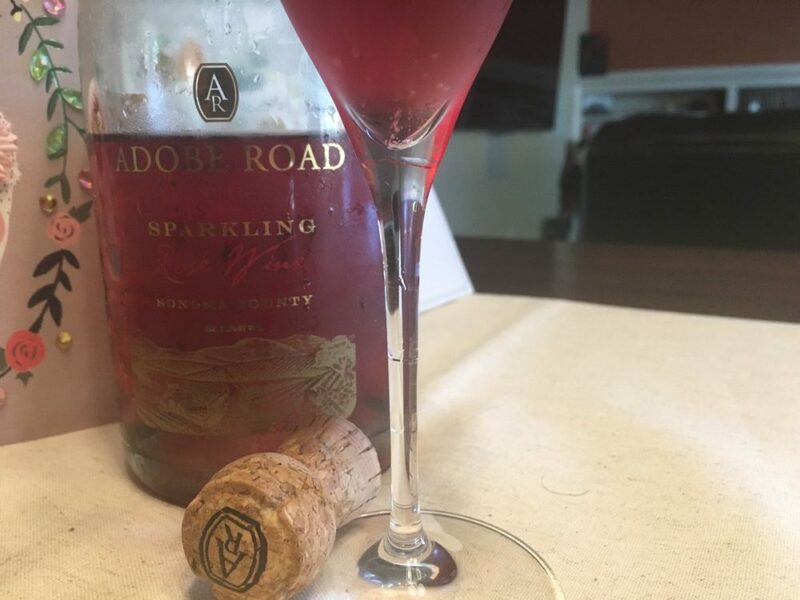 More Info: I received the Adobe Road 2016 Sparkling Rosé Wine as a sample for review. (Cheers Gail!) Retail: $28. For more information about Adobe Road Wines and to purchase wines directly, please visit the Adobe Road Wines website.